Can you make this election arithmetic add up? Yesterday’s blog post headlined Frank Field’s election campaign spent £254.40 on balloon gas but what else was money spent on? contained a donations page (which is below). 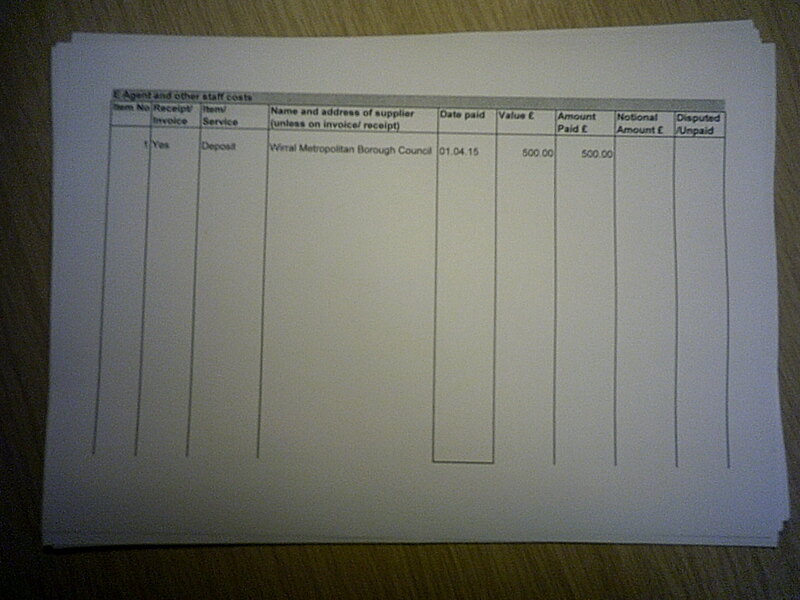 As you can see above, Wirral Council has removed the names and addresses of the individual donors who donated £100 and £250 to Frank Field’s election campaign. However the legislation, s.89(1A) of the Representation of the People Act 1983 only allows them to remove addresses of individual donors to candidate’s election campaigns, not the names of individual donors too! I have e-mailed Wirral Council requesting the names of the donors who donated £100 and £250, which shouldn’t have been blacked out when I inspected the return. There’s also something declared in the election expenses for Frank Field’s campaign that from a technical legal perspective shouldn’t have been included as election expenses. To stand as a General Election candidate you require a £500 deposit which is refunded if you get 5% of the vote. 7 The payment of any deposit required by rule 9 of Schedule 1 to this Act. Rules 9 of Schedule 1 relates to the £500 deposit for parliamentary elections and is below for reference. 9(1) A person shall not be validly nominated unless the sum of £500 is deposited by him or on his behalf with the returning officer at the place and during the time for delivery of nomination papers. (c) with the returning officer’s consent, in any other manner (including by means of a debit or credit card or the electronic transfer of funds) . but the returning officer may refuse to accept a deposit sought to be made by means of a banker’s draft if he does not know that the drawer carries on business as a banker in the United Kingdom. 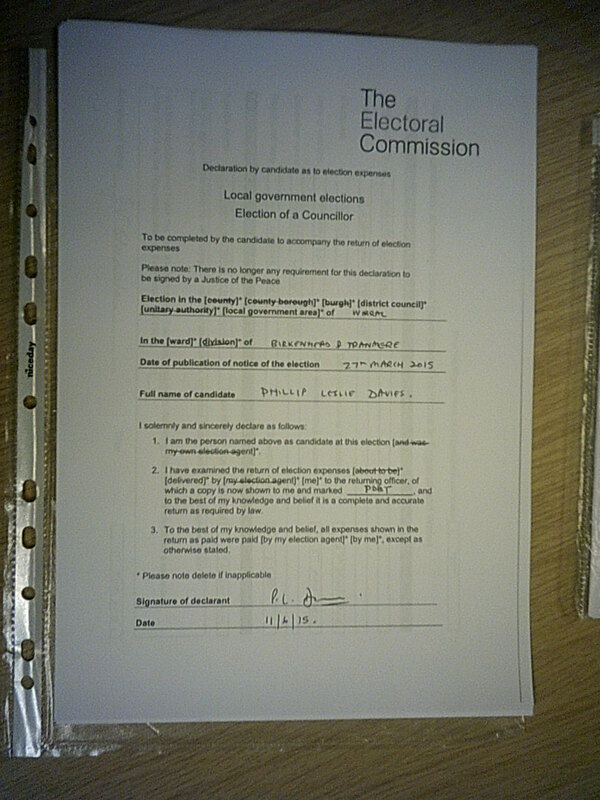 (3) Where the deposit is made on behalf of the candidate, the person making the deposit shall at the time he makes it give his name and address to the returning officer (unless they have previously been given to him under section 67 of this Act or rule 6(4) above). However moving on from trivial matters, to the more serious issue of how you split expenses incurred jointly between two campaigns. 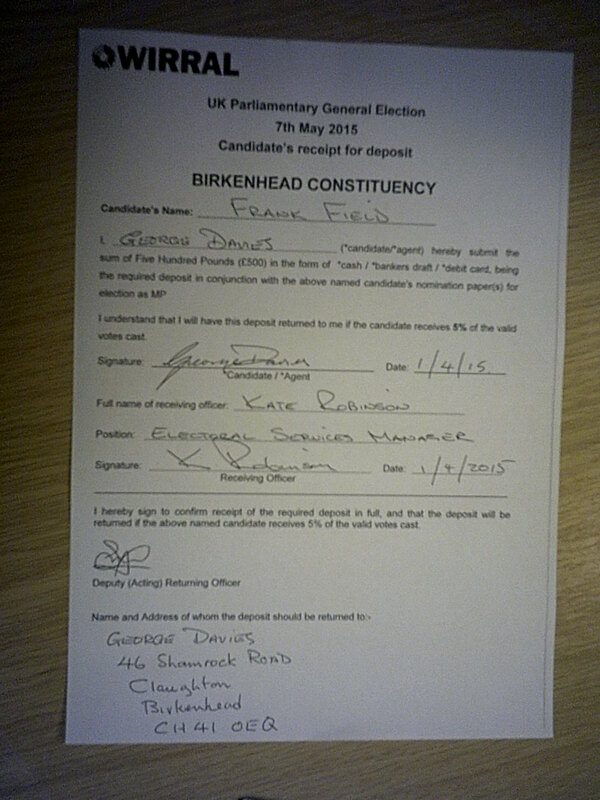 Below are the declarations of Phil Davies and his election agent Jean Stapleton about Phil Davies’ election expenses return in Birkenhead and Tranmere stating that to the “best of my knowledge and belief it is a complete and accurate return as required by law”. 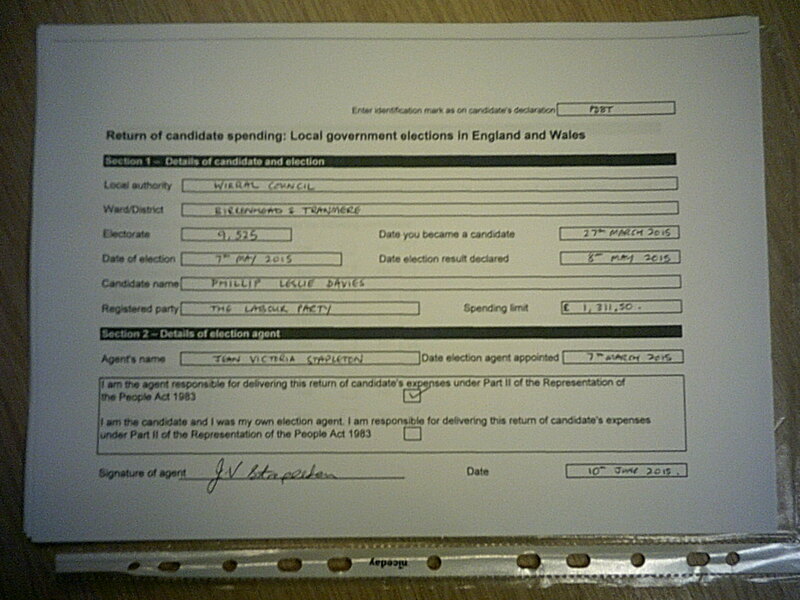 There are maximum expenditure limits for local election candidates, which are set at £740 + 6 pence per an elector. As there were 9,525 electors in Birkenhead and Tranmere this means the maximum expenditure limit comes to £740 + (£0.06 times 9,525) = £1,311.50 . You can see this amount used for Phil Davies’ election expenses return below. Spending over these limits is classed as an illegal practice, see section 76 of the Representation of the People Act 1983 and if the candidate and/or agent “knew or ought reasonably to have known that the expenses would be incurred in excess of that maximum amount” then a court can find them guilty of an illegal practice and they could be barred from standing in the by-election that would result. The total spent by Phil Davies’ campaign as declared on the election expenses return was £1,266.17 as you can see from this page below. 5.19 In all cases you should make an honest assessment, based on the facts, of the proportion of expenditure that can fairly be attributed to your candidate spending. 5.20 This is important, because when you sign the declaration for your election expenses return, you are confirming that the return is complete and correct to the best of your knowledge and belief. As part of the campaigns of Frank Field and Phil Davies a joint leaflet was put out and the total costs of £1,511 were split between the two campaigns. 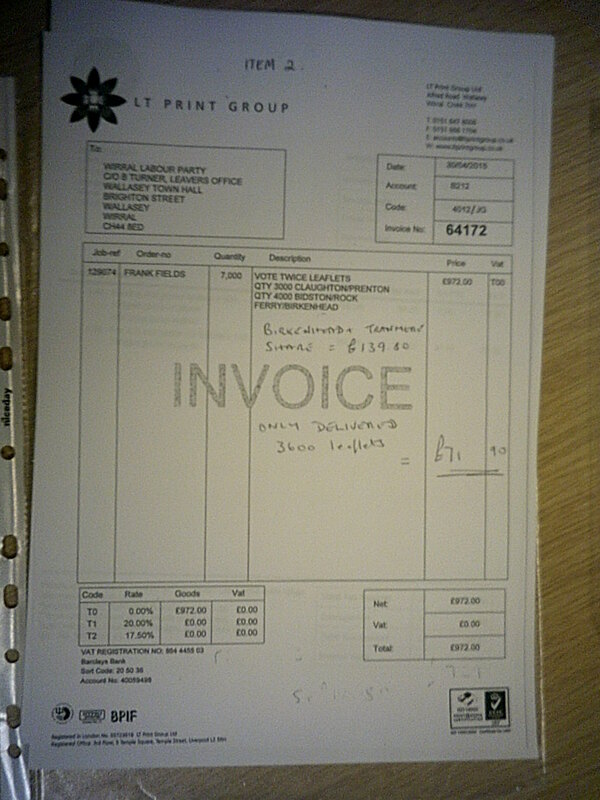 As you can see below £377.75 of the joint leaflet was attributed to Frank Field’s campaign. 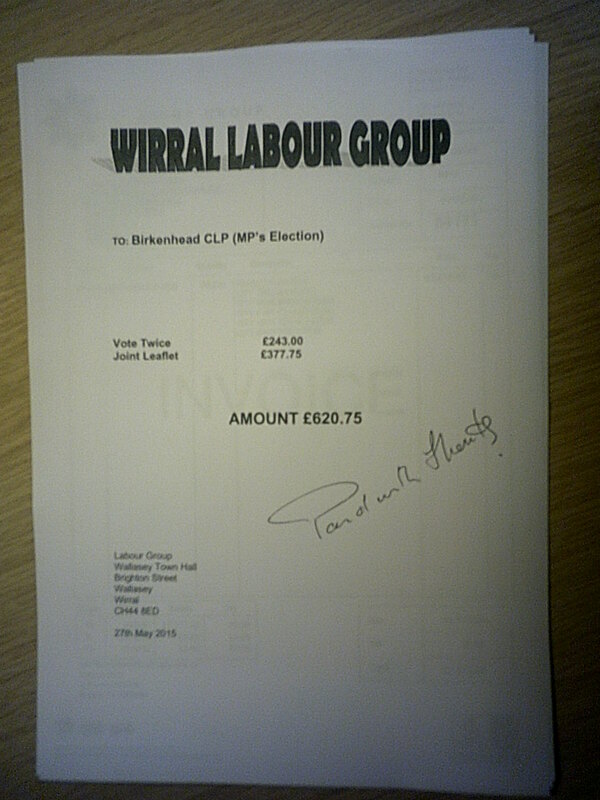 The invoice submitted as part of Phil Davies’ election expenses return show that the remaining (£1500 – £377.75) = £1133.55 was split five ways equally between the campaigns for Bidston & James, Birkenhead & Tranmere, Claughton, Prenton and Rock Ferry. The portion of this leaflet attributed to Phil Davies’ campaign was £226.65. 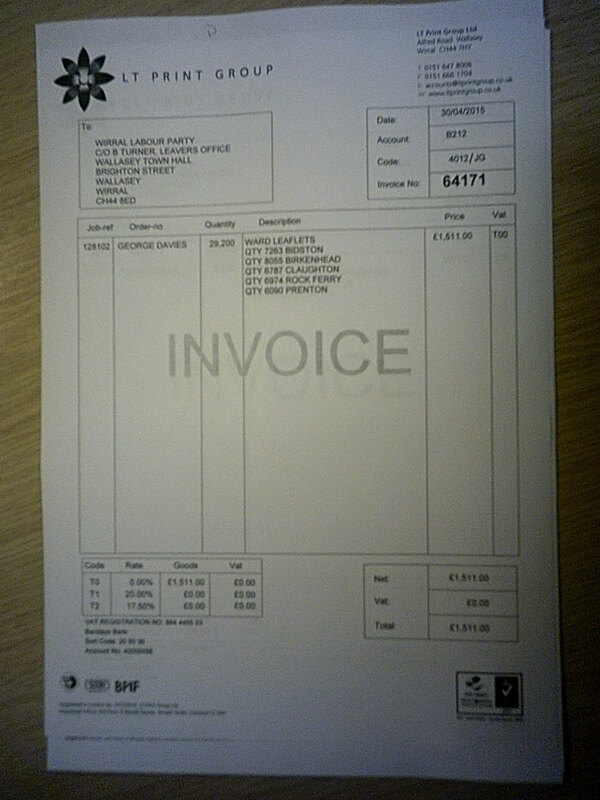 However different amounts of leaflets were printed for each area (as you can see on the invoice). 7,263 for Bidston & St. James, 8,055 for Birkenhead and Tranmere, 6,787 for Claughton, 6,974 for Rock Ferry and 6,090 for Prenton. This total comes to 35,169 leaflets. The proportion for Birkenhead and Tranmere was 8,055. 8,055 divided by 35,169 = 22.9%. 22.9% of £1133.55 = £259.58 (£32.93 higher than the number used when it is instead just split five ways instead). This wasn’t the only joint leaflet between Frank Field’s and Phil Davies’ campaign though. There was also the “Vote Twice” leaflet. As you can see below, £243 of this was attributed to Frank Field’s campaign. 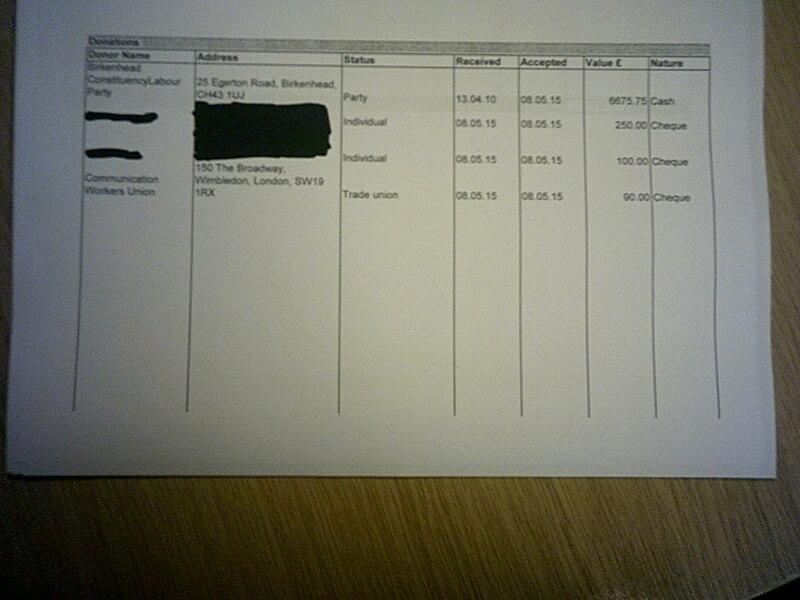 Here’s the invoice for the vote twice leaflet submitted with Phil Davies’ election expenses return. This is where I can’t even understand how the split used has been arrived at. If £729 was split five ways it would come out as £145.80 per a ward. If £729 is split by numbers of leaflets delivered in Birkenhead and Tranmere it would be £729 * (3600/7000) = £374.91. If the amount for the proportion of leaflets for Bidston/Rock Ferry/Birkenhead (4000) is calculated as 4000/7000 * £729 = £416.57. Then as it’s for three wards it’s divided by three, £416.57/3 = £138.86 (which is near enough to one of the figures used of £139.80). However this figure (£139.80 would be for 1333 leaflets (4000 divided by 3)). For some bizarre reason 3600/7000 has been used to arrive at a proportion of £138.86 as £71.90. Doing it this way appears to be incorrect (to me anyway as logically if 3600 leaflets were delivered instead of 1333 it should lead to an increased not decreased amount). If 3600 leaflets were delivered in Birkenhead and Tranmere then the figure should have been (£972 – Frank Field’s share (£243)) * (3600/7000) = £374.91 (£303.10 higher then declared). The net effect of using of both these calculations under the “honest assessment principle” of sharing costs between these joint leaflets is to increase the expenditure on this campaign by £32.93 + £303.10 = £336.03. This would make the total expenditure £336.03 + £1,266.17 = £1602.20 (massively above the maximum expenditure limit of £1,311.50). So who’s got their figures wrong, myself or Phil Davies and his agent? « Frank Field's election campaign spent £254.40 on balloon gas but what else was money spent on? I’ll try and make it simpler then. On the first joint leaflet, after the proportion for Frank Field’s campaign is taken off, the rest has been split five ways as it’s simpler then splitting it by the proportion of leaflets printed for each area. 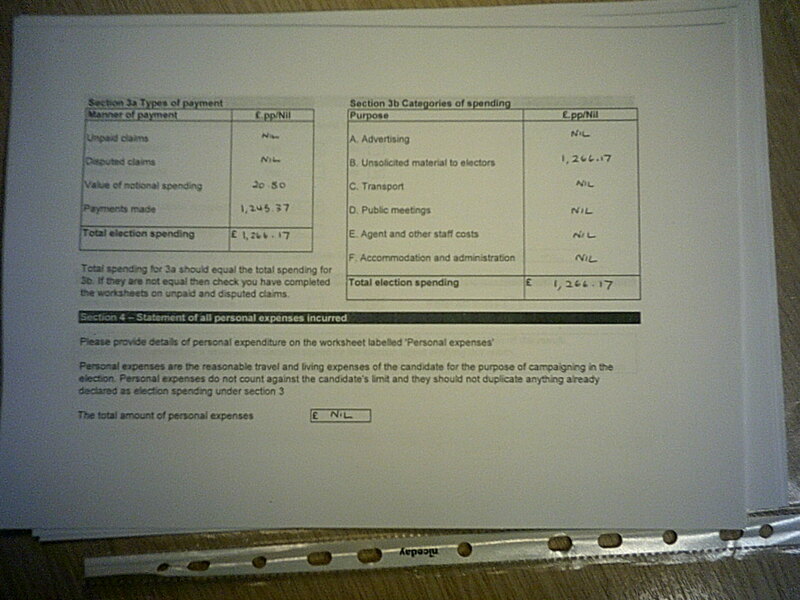 Doing it the latter way leads to the cost being £32.93 higher (but still within the expenditure limit as the election expenses return for the campaign stated it spent £45.33 below the limit). However it’s the way the costs were proportioned for the “Vote Twice” leaflet that also has me stumped. Total cost was £972 of which £243 was allocated to Frank Field’s campaign leaving £729. 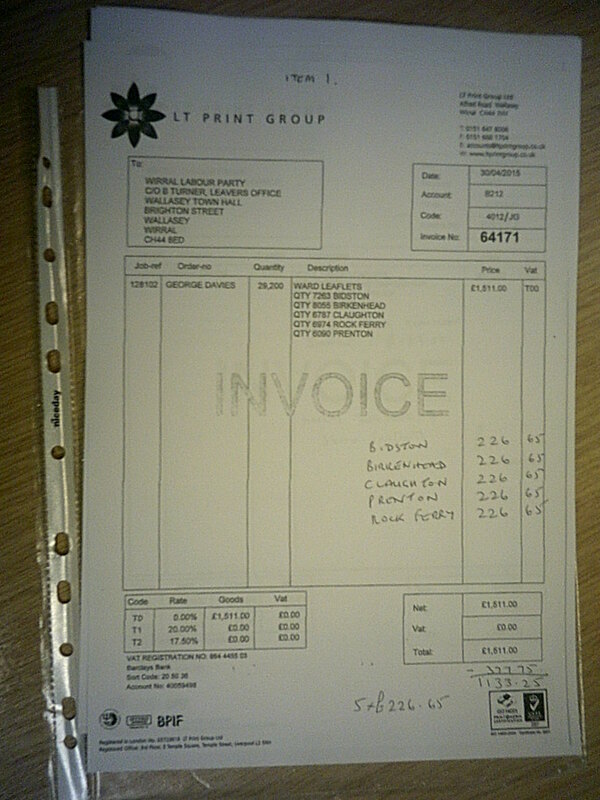 That was an invoice for 7000 leaflets (3000 for Claughton/Prenton and 4000 for Bidston/Rock Ferry/Birkenhead). If you go by what the invoice states then a fair estimate of what was delivered in Birkenhead & Tranmere ward would be 4000/3 = 1333 leaflets. 3600/7000 * £729 = £374.19 ? I really don’t understand how the £71.90 figure was arrived at for 3600 leaflets. However £71.90/£138.82 seems to be the same ratio as 3600/7000. I am bowing out of the whole Wirral “Funny” Biz Wirral Clowncil criminal activity debate next week four years to the day since I got myself sacked for not taking part and going along with them in their robbery of up about £2,000,000.00. “Phil the pickled Dill” said in the local rubbish propaganda sheet. Town hall leader Phil Davies said: “Everyone should have the opportunity to provide adequately for themselves and their families. Hey “Dill Brain Davies” I have been on the dole for four years almost to the day since Kevin Adderley directly lied to me in front of Paula Basnett with a horrified look on her face. She was then told to keep her gob shut…her words. Then Dave Garry was got at to change an audit report then was paid off. At 63 and having had three interviews in four years it is all over for me as of the fourth anniversary next week. Good luck mate it really is a stinking rotten fetid council and that goes for everyone who has heard “Highbrows” evidence and kept their rotten filthy gobs shut. Not in the public interest to release the DCLG Report my arse of course it is is you are as bad as the original criminals. Sorry to hear that James. The report seems to be at the stage the Anna Klonowski Associates report was in December 2011. However it was only by whistleblowers keeping the pressure on that the following happened on the 13th February 2012. Cllr Steve Foulkes was removed by a no confidence motion as Leader of the Council and the Labour administration was replaced by a Tory/Lib Dem one. · We stand publicly accused of mismanagement, incompetence, negligence and cover up. · We have been found guilty of failing to listen or believe Martin Morton and allowing him to be bullied, belittled, browbeaten and driven from a job he loved. · We have shown ourselves to be incapable or unwilling to apply basic controls on the expenditure of Council Taxpayers money or of being able to provide protection from abuse, compassion & care to some of the most vulnerable members of our society and their families. · Not one senior officer or politician has been held accountable by the Council for the failings identified in the AKA Limited report. (2) Council believes the nature of the crisis the Council now finds itself in is so grave, the imminence of collapse so real, that all Members must come together, under fresh leadership, to work together on behalf of our residents & communities, as equals and in genuine partnership. (3) Now that the Council has received the AKA Ltd Final Report Independent Review of Wirral Metropolitan Borough Council’s Response to Claims Raised by Mr Martin Morton (and Others), we can all see the extent of the alleged mismanagement, incompetence, cover-up and negligence over a long period of time. These are extremely serious allegations relating to the care and safeguarding of some of the most vulnerable people in society. People to whom the Council owes a duty of care. (4) Although the report documents the failure of Council Officers, Council believes that it is incumbent upon all Councillors to ask themselves whether they could have asked more, or different, questions and uncovered or prevented some of these failings at a much earlier stage. In view of the apparent scale of wrong-doing and the length of time over which this happened, Council believes the Leader of the Council should explain whether he knew what was going on, and if not, why not. (5) Council believes that, despite all the advice and support available, the current Leader’s approach has not been as inclusive as was promised. In practice, the Leader’s approach has been to say publicly that he wants to work with all Parties, but then to carry on as before. Council is not convinced that the current Leader is committed to finding an all-party solution to the many questions raised in the Report. It is of considerable concern that this behaviour has contributed to the serious danger of collapse that this Council now finds itself in. It clearly isn’t working and we need a fresh approach and a true commitment to put aside political differences and work together in an All-Party Cabinet to concentrate exclusively on putting right the many wrongs identified. Council believes that Councillor Foulkes is not the right person to lead such an All-Party approach. (6) Therefore, Council resolves, in accordance with Article 7.3(iii) (d) of The Constitution, that Councillor Foulkes be removed from the Office of Leader of the Council with immediate effect. 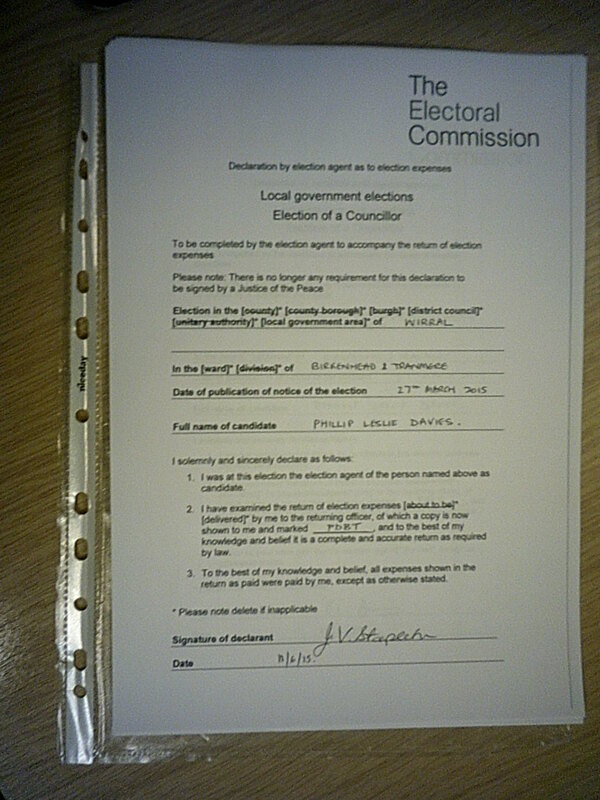 (7) That Council elects a new Leader in accordance with Council Procedure Rule 5B. · Review current officer delegations to ensure openness, transparency and effective democratic oversight of decision making. (9) Pursuant to Council Standing Order 5A(2)(e), Council resolves that with effect from the 14 February 2012, the Chair of the Employment and Appointments Committee be reallocated to the Conservative Group and the Chair of the Children and Young People OSC be reallocated to the Labour Group. They court and fate the fat pig and make him number 1 citizen. Then they put in a “dill” that thinks he is in charge. I don’t care mate who I insult anymore if they deserve i….. four years on. “Highbrow’s reply to the DCLG FOI. “apologizes”, I take apology as meaning a defence of ones actions which of course you do not provide. No rationale as to why you breached statutory limits in providing any answer at all. “defence of your actions that you wished to extend your breathing space since you now have obtained a further 20-40 days of Internal review time on top of the extended period you have already enjoyed. “reasonable” estimation. I would like you to consider how effective your audit function appears to the public when it takes your department’s inadequately staffed audit department-one employee to cover the North West region so long to remedy long-standing abuses. If the public, and indeed whistle-blowers , who risk their careers to expose financial wrong-doing must wait so long upon your department to even report on your findings then the effectiveness of your audit department is seriously undermined. I cannot imagine any whistle-blower being encouraged to speak out to you in the future. This latter effect is determinedly not in the public interest since it neuters your audit department, and encourages companies to risk abusing public contracts. should need you to deliberate from December 2013 until June 2015 and beyond, a period of 18 months so far, and I suggest that you get on with it. I certainly am going to make representations to the court of Auditors in Europe about this matter. If it be claw-backs that you are discussing levied on any negligent local authorities then why were you able to make conclusions against Social Enterprises North West in Liverpool-a £4m claw-back,which no doubt you will never collect-in so rapid an order-the project starting in 2012 and concluding in December 2014 with the claw-back? Is it because local authorities are public authorities and Social enterprises North West was a private company? It is not in the public interest for your department to appear to “manage” scandals where public authorities are involved but to slam down hard on small private companies. John it is no wonder how all the old blokes down the swimming pool talk of what council money is coming through licking their lips every morning. They know if they steal and abuse grants the counil will defend them to the very end. The Clowncil just laugh at the Audit Commission and now Grant Thornton and apparently also the one DCLG auditor for the North West. Adderley and Ball and the rest of the crud and slime that is Wirral just know it can do and say whatever it wants. They are untouchable as long as no one like Stuart Kelly doesn’t speak up. The people should know how their council tax can be abused and Wirral just abuse to their hearts content. Stuff Denmark John Wirral is an evil evil dump in Wallasey. Come on Ecca defend your crap. Mr Griffiths, Mr Brace, Good Morning to you. Mr G re the above, let me first say how I do feel your pain and all involved in this. Then let me address the comments you and others make. Unfortunately over the years I have experienced life, sometimes at the Messy end of life and as previously stated I have known some Scumbags and Low Lives. I will say; that I have never come across a bigger bunch of Scumbags, in my life than the people you are dealing with now. Again I say this because I too have had some shite off them. In my younger and healthier days, they would have been dealt with by now. First of all, you may find that there are several reasons why these people cannot release Reports, mainly it would not be in the Public Interest, other Crimes against the State are being Committed and are being Investigated (Re FOI Requests and Refusal to Disclose). Other Investigations and Prosecutions maybe ongoing and again it would hinder those Inquiry’s/Prosecutions. I would suggest that any Reports to the European Auditors may have, could, compromise the above and give information (Aide and Comfort) to Metaphorically speaking the Enemy. I refer you to my previous comments and most recently the comment reference STELLA SHIU, AKA and Peel. There is indeed more to this, but it is not my intention to pursue that at this stage, although I will say that locally Sedition has been Preached and more importantly Overt Treasonable Acts committed (Public Order Act 1998?). Besides Serious Fraud, False Accounting, Theft, etc, in fact a near complete Statute Book of Offences and it is my intention to contact the Director of Public Prosecutions into this latest Debacle of Elections. The only thing that these people have done to me and others yet is Shoot me or S— me and I also have nothing to lose and all to gain, as the Bishop said to the Actress. I feel and believe that I now have sufficient Evidence in order for me to take that Course of Action, so much so that for sometime now I have had this Council and some of its senior employees by the short and curly ones and should they try any type of further Prosecution or Badness against my Family it would come out anyway. Mr Griffiths keep your Pecker up and try not to get caught by the Pretend Friend and his mates Steve Harper. Belonging to Another, With the Intention of Permanently Depriving the Other of It (Thief and Steal shall be Construed Accordingly – It is Immaterial if it is for Thief’s Own Gain or benefit). I mention these Offences, as I have been exposed to them and been in Harms Way, because of that I mention only myself. I have given these people ample opportunity to give themselves up and Atone for their Now Criminal Activities. The reason I have not mentioned any names is because they have a “Right to a Fair Hearing” as previously stated we are not a “Totalitarian Regime Yet” Now how would that a/effect the Representation of the People Act 1983? Mr Brace? I’ll answer it this way. When Warren Bradley pled guilty to an election offence, the offence he pled guilty to was perjury. There’s also an offence of making a false statement in a statutory declaration which carries the same punishment as perjury. If a person was found guilty by a court of a breach of section 76 of the Representation of the People Act 1983 it’s punishable by a fine of up to level 5 (up to £5,000) on the standard scale (see s.169 of the Representation of the People Act 1983) and also the person (or persons) concerned would be barred from voting or holding elective office (s.173 Representation of the People Act 1983). Yes people have a right to a fair hearing, but a hearing only happens if the Crown Prosecution Service decide that it’s in the public interest to have a prosecution. That would only happen if someone first made a complaint to the police. And if you read the Representation of the People Act 1983 you’ll find that the Director of Public Prosecutions can make inquiries about election offences and start such prosecutions (usually the role of the police/CPS). Mr Brace, Thankyou for that information, I will consider speaking to them on this, there is also the Parliamentary Commissioner or (Ombudsman) on the other matters, I will bet you ” Not a Lot of People Know that “. Mr Brace, If you breakdown the sectional parts of the Theft Act and Fraud Act, Your Blog would suggest Unlawful Activity under the Representation of the People Act 1983, if you take it a step further ” If even the most hardened of Labour voters had known that Stella Shiu, aka and her little Band of Roving Vagabonds, who were also connected to the Hong Kong Fraud Case. Would they have consented to have Vote for Labour Councillors and would Phil Davies now be in a position to be calling the Conservative Government all the names under the Sun, reference Austerity and if he is allowed to continue is there any likelihood of Problems (Marchers) on this side of the River Mersey. I would Strongly Suggest that Leader Call in the Administration and Police and I am only to Willing to give a Statement and attend Court if Necessary. Further they all know who I am because I have told them, that is why I am still in Harms Way.